A small but very versatile module. It is derived from the original Elektor Formant book "Formant Erweiterungen" p87 ff. Some resistor values are changed to handle the 10Vpp signal level of my system. You can shape the input signal in many ways. You can clip the signal. You can fold the signal. You can emphasize the third harmonic. You can unsymmetrical emphasize the clipped and unclipped signal. You can reverse the input signal. The clipping level is voltage controlled. 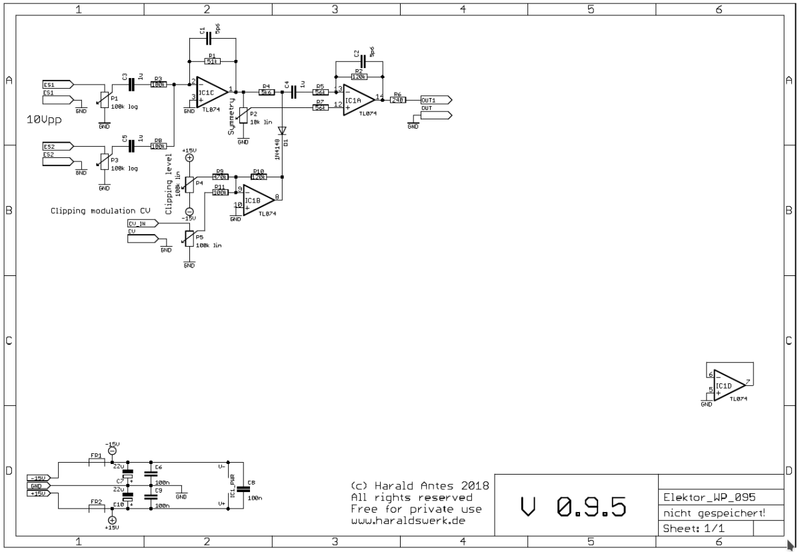 This implementation follows closely the original Elektor Formant implementation. Refer to the original documentation if needed. You can find it on the net. My changes are the adaption to my 10Vpp system signal level. All schematic, pictures, drafts, descriptions and other text at the site www.haraldswerk.de and in the associated blog are, if not otherwise mentioned, owned and copyrighted by Harald Antes. They are free for private use only.